As soon as I knew we’d be in Kyoto on the 1st April I mentally blocked out the middle of the day for the Kenka-sai festival. Incorporating festivals and cultural events on our Japan trips is something we’ve done since our first visit and it’s provided some great experiences and memories. It’s so much fun to be part of festivities that are unique and have a cultural significant to a country and when it’s a small or local event it can be especially enjoyable. There are so many seasonal festivals and events that it’s not too difficult to find one that ties into your travel dates. 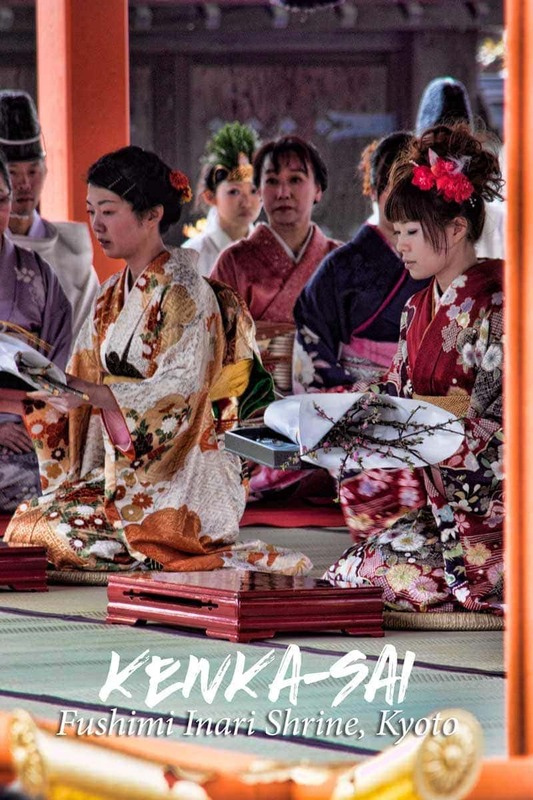 Kenka-sai is a traditional Japanese festival that takes place during spring and autumn. We attended at Fushimi Inari Shrine in Kyoto where it’s held on the 1st of April and November. 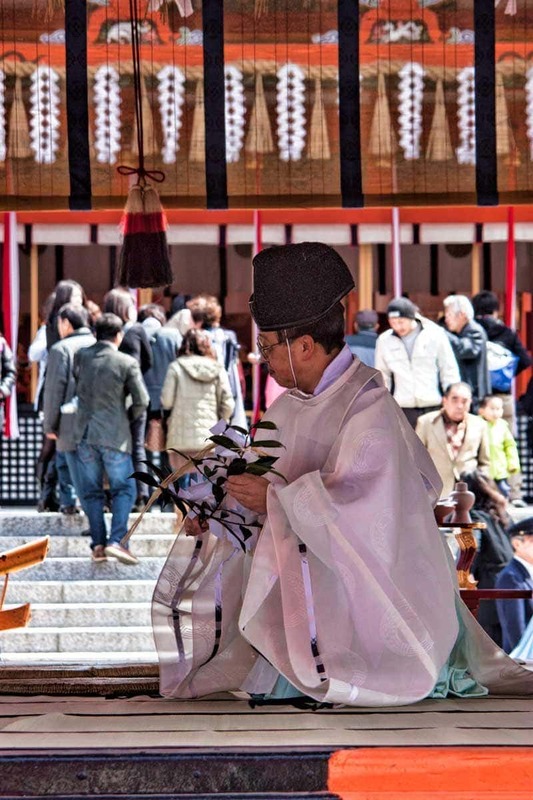 The ceremony involves the offering of flowers at the shrine as an expression of gratitude and respect to the Kami. Kami are deities but they represent mostly nature and natural events. For example at the Fushimi Inari shrine the Kami is the rice god. Having rice historically meant having food and therefore wealth and over time the shrine has come to be associated with general prosperity. Starting at 11am a procession of local women from the Ikenobo School of flower arranging arrive at the first torii gate. They’re dressed in beautiful high quality kimono and carry offerings of flowers. The offerings will be assembled in the minimalist style of Ikenobo ikebana which appreciates the beauty not only of a perfect flower but of a bare branch or withered bloom. The procession moves slowly up the entrance path beneath the torii gates, through the dramatic main gate and toward the covered stage. 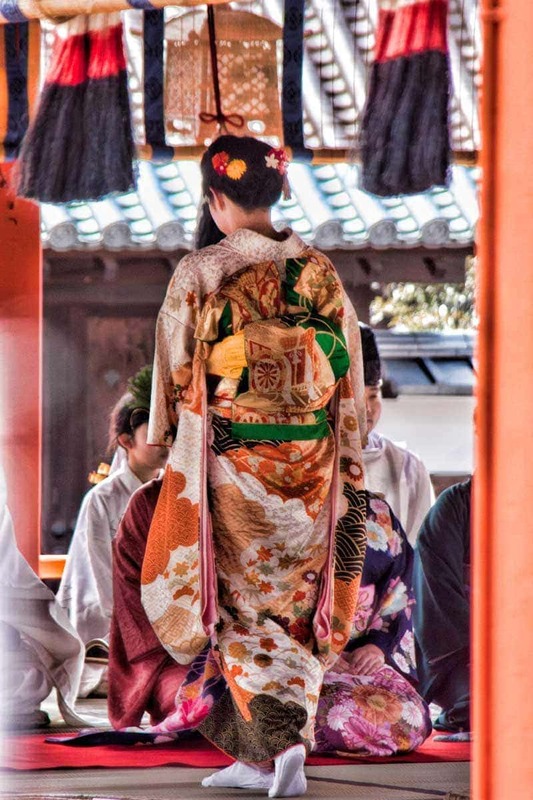 The ladies remove their geta, a thong style of shoe worn with kimono and take their place on the Kagura-den. The Kagura-den is essentially a large stage used for sacred dance and ceremonies. 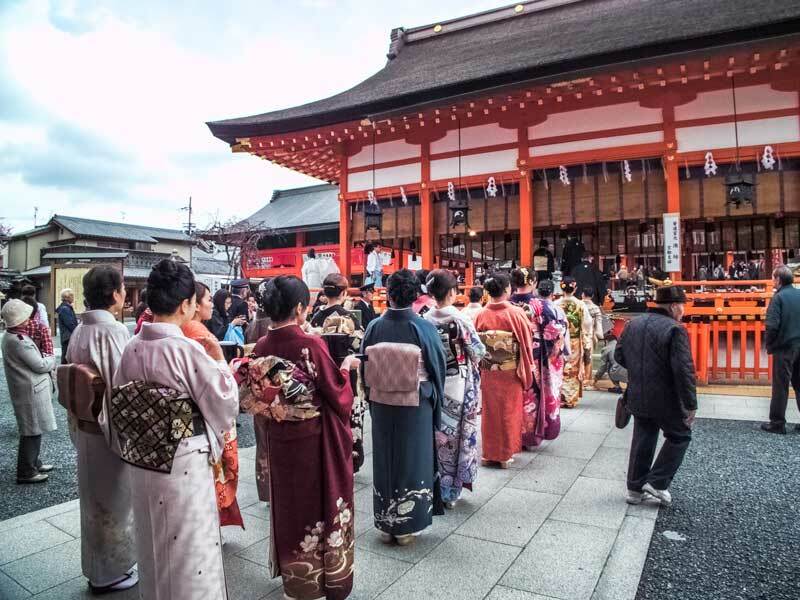 Shinto Wedding traditions are elaborate and in some shrines including Fushimi Inari and Hachimangu in Kamakura we’ve also seen weddings ceremonies take place on the stage. Next the senior priests approach the kagura-den and take their positions on the stage. We were there earlier in the morning to climb the hill under the 1000’s of torii gates so we saw a bit of the preparation taking place. 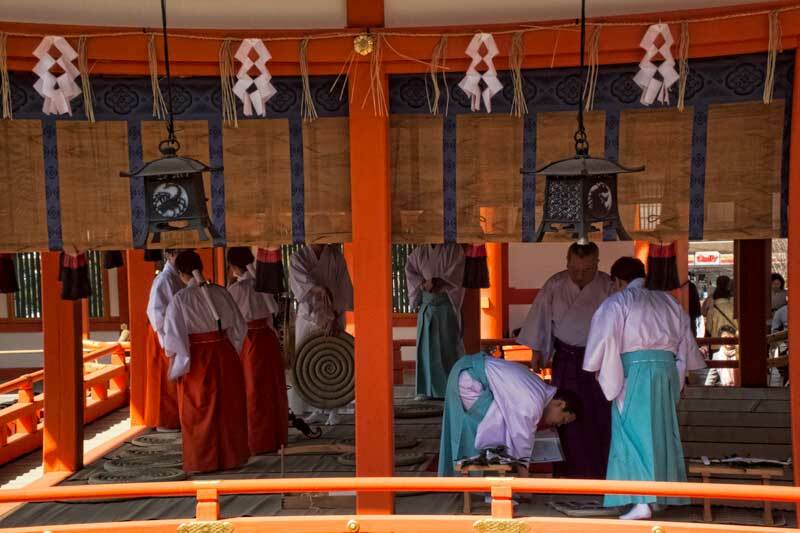 The set up and ceremony plan was checked and double checked by the shrine maidens (Miko) and Priests. It might be a small ceremony but it’s important that it runs without a hitch. The ceremony itself is conducted quietly. We don’t understand Japanese anyway but the words were spoken at a volume for the Kami and those on the stage to hear not broadcast to those watching. The movements of the participants were elegant and fluid making the procedure calming and a pleasure to watch. During the ritual the components carried onto the stage by the women were presented and assembled. Fushimi is a ward of Kyoto city located slightly south of the city. The easiest way to get there is by JR train arriving at the Inari station. It will take around 5 minutes on the Nara line and cost Y190. If you have an active JR Pass it will cover the trip, alternatively you can buy tickets from the machine or use a stored value card such as the Pasmo or Suica. The shrine is a short walk from the train station and the right direction is clearly marked by the bright vermilion torii gates. The procession starts promptly at 11 am so be there a little early to get a good position to watch as they move up the main approach to the shrine. The year we attended the 1st fell on a week day and while there were more people than you’d expect normally it wasn’t a huge crowd. The shrine itself is always open so you can arrive as early as you wish. Its worth allowing time to explore the shrine itself and the paths and hiking trails behind it. The views from the top of the hill at the end of the trail back over Kyoto City is worth the climb up the steps. Access to the shrine and event is free. I believe entry is always free at Shinto Shrines unlike Buddhist temples where the larger more popular ones do charge a fixed entrance fee. There are a number of offering boxes at different shrines within the grounds so we normally make a contribution that way. There are toilets on site and a kiosk that sells the usual charms and ema tablets. The ema at Fushimi Inari are either of a fox face or a torii. If you have a goshuin, temple stamp book, you can get that stamped and the calligraphy added here too. There are some small restaurants and stalls on the way up the trail behind the shrine that specialize in inarizushi. This seasoned rice stuffed into a deep fried soy pocket was reputedly the favourite food of the fox, the messenger of the kami. It might be a favourite of me too. There are also a number of good and reasonably priced restaurants around the entrance to the temple. 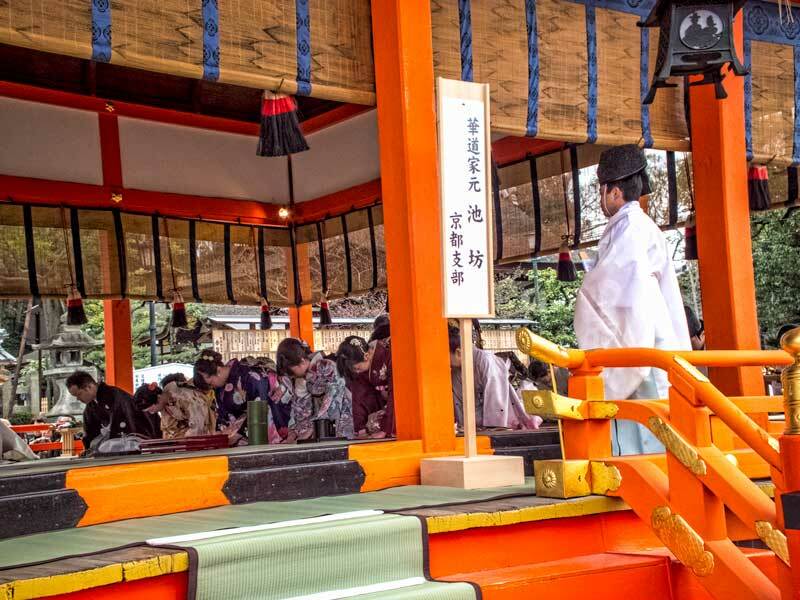 A few people have mentioned to that they are uncomfortable visiting events at shrines because they are unfamiliar with the Shinto practices and what is expected of them. Here’s a quick overview on what happens in a shrine and a few tips. This looks like such a peaceful experience. I think smaller and more local festivals are usually the best ones. You took some beautiful photos. I especially love the ones of the women in their kimonos. I try and time our trips around festivals as well. You can learn so much about the people and their culture. The Kenka-Sai sounds like an amazing ceremony to witness. I really like the picture of the women in traditional dress carrying the flowers! Your photos are beautiful Toni – even though you can’t necessarily hear any of the proceedings, to be able to catch the procession and watch as the ceremony happens sounds wonderful – the women are so beautiful in their traditional dress! Oh wow!! I love fitting in special festivals into my travels too! I’ve never heard of this particular one. The kimonos are so beautiful! Looks amazing and I can see why you would want to make sure you got to see it. They are such a great (and important) way of understanding local and country culture aren’t they!? Loved reading the shinto tips too. The Kenka-sai festival sounds great. I’ve told you before how much I want to visit Japan, so every time I visit your Nihon pages it makes me want to fly out of Ouarzazate tomorrow! It’s very interesting to see how Japanese people can combine tradition and modernity. The Ikenobo School women procession looks lovely, all dressed up with the traditional clothes. It doesn’t really surprise me that the ceremony itself is conducted quietly as Japanese people are indeed very serene and polite. I love this place… Thanks for sharing with us. Greetings from south Morocco! Thanks Joao, I’m sure you’ll get there, you’ve explored so much of the world already! This festival looks very interesting. It would be great to visit during the Kenka Sai. The costumes and makeup are ornate yet quite beautiful. Great to know about this twice yearly event. What a wonderful experience. We love to do cultural activities and would love to go to Japan to see this sort of festival. Wow I would love to attend and witness this festival. Lucky you! Witnessing cultural and traditional events gives you such a better understanding about a place, doesn’t it? They’re definitely worth looking out for when you’re in a new city. Japan, and much of Asia is especially good for having events like this all through the year. That’s fantastic that you were there to experience the Kenka Sai. I love the tranquility of the procession and I can see how it would have a relaxing and calming effect. 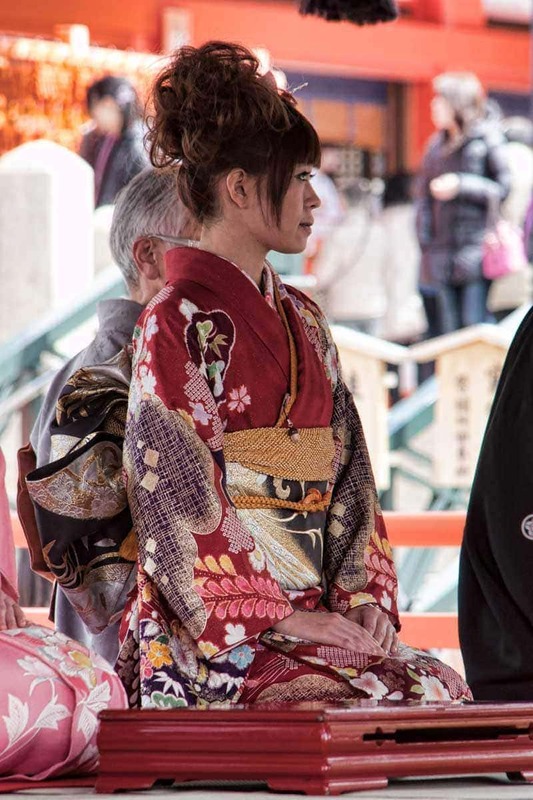 I love the kimonos, so colorful and detailed. I’d love to experience this sometime, thanks for such a detailed review! It’s so nice to experience cultural or religious events – you get a better perspective and context of the places you visit.